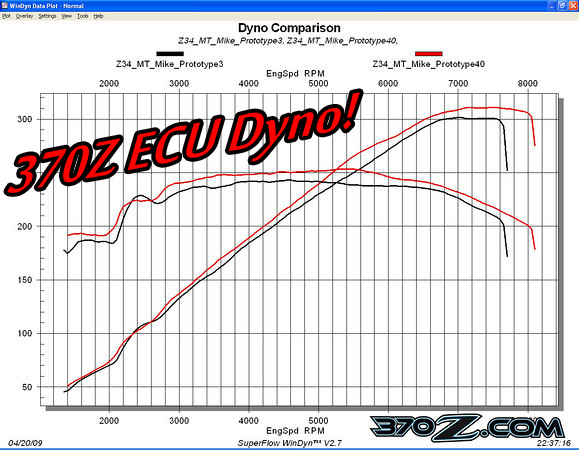 Nissan 370Z Automatic Transmission performance parts Dyno Thrash! We strove for accuracy and repeatability in our testing. We did all of our testing during one day. We used standard SAE correction. We thoroughly warmed up the VQ37VHR engine and the drivetrain by driving the car on the dyno at speed for about 10 minutes to warm the engine, transmission and differential oil (this car is equipped with Technosquare’s oil cooler kit) as well. 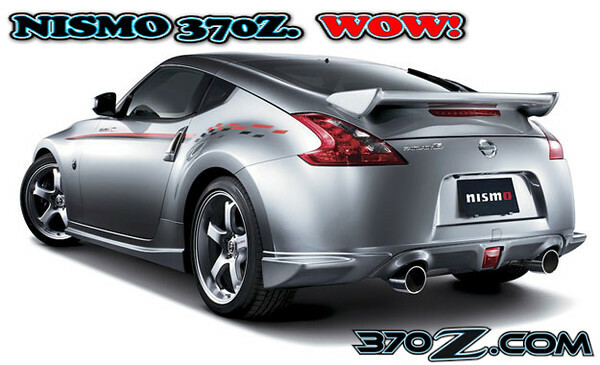 Nissan's 350 hp Nismo 370Z model due in June! The Nismo 370Z is not only a looker but as you would expect from Nismo, has functional performance improvements over the base 370Z as well. The Nismo 370Z comes with an exclusive, unique and functional body kit that is not available as a Nismo accessory at the dealership. The wind tunnel tuned and racing-inspired body lines are fierce with sculptural fenders, upswept quarter windows, vertical door handles, and aluminum hood, door panels, and hatchback. 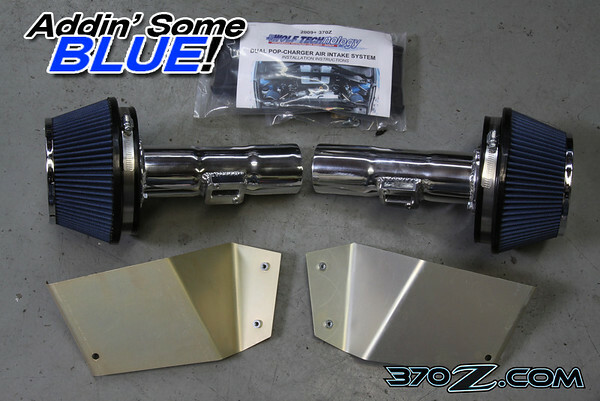 Technosquare's Nissan 370Z oil cooler kit solves oil temp issues! 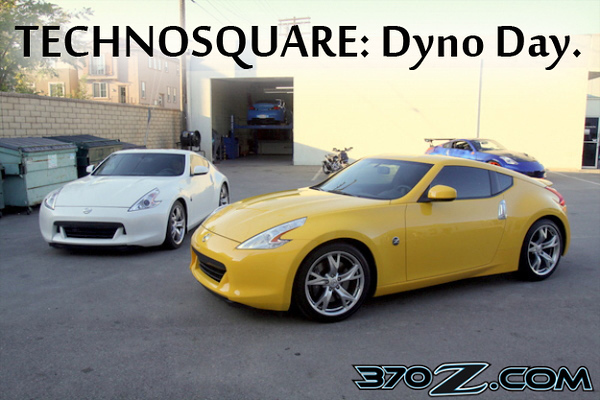 Technosquare's Nissan 370Z/ Infiniti G37 performance ECU Reflash Released! Technosquare changes the factory fuel, timing, rev limit and VVEL/VTC cam control maps to get a respectable gain of 11 whp and 10 lb/ft of torque. The gains are pretty much across the board, starting at 2700 rpm and continuing until the rev limiter stops the fun. The gains are large and consistent through the entire rev range, greatly increasing the area under the power curve. 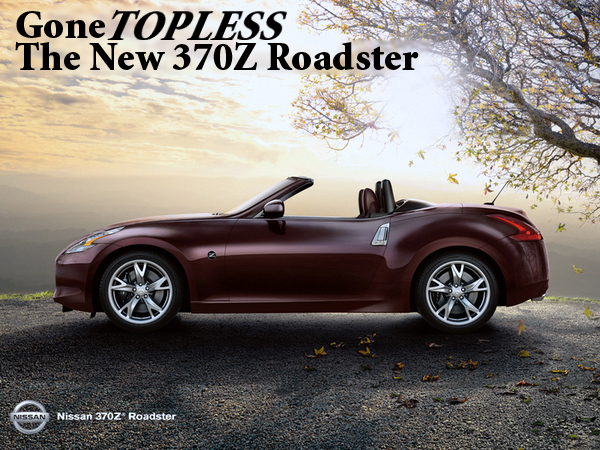 Nissan 370Z Convertible Hits the Street! The Nissan 370Z Roadster also uses the Z Coupe’s multilink 4-wheel independent suspension. 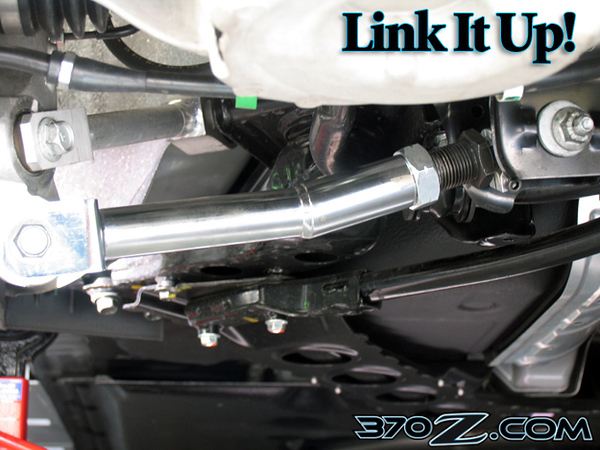 This suspension setup is a double wishbone 2-link front and 4-link rear suspension, an improvement over the over-complicated articulated lower multi-link setup in the 350Z. The suspension is lighter and stiffer with forged aluminum arms, lighter stabilizer bar offering a 35% improved leverage ratio, and lightweight rigid rear cradle incorporated as a single piece. The rack and pinion steering design is speed sensitive and includes a solenoid valve that damps unwelcome steering kickback and vibrations. The Vehicle Dynamic Control (VDC) system is still a standard feature. We Test Jim Wolf Technologies Nissan 370Z Dual POP Charger! We used a new six speed sports model Nissan 370Z with a few hundred miles on the odometer as our test subject. Before the installation of the JWT Dual POP, we baselined the car on Technosquare’s AutoDyn 30 Superflow chassis dyno. The Superflow dyno is unique in that it uses both an inertial weighted roller and an eddy current load cell to provide the working load against the engine. Now that we got our car drawn out and colored, it is time to put some new kicks. In this case, I chose the VOLK GT-V's. 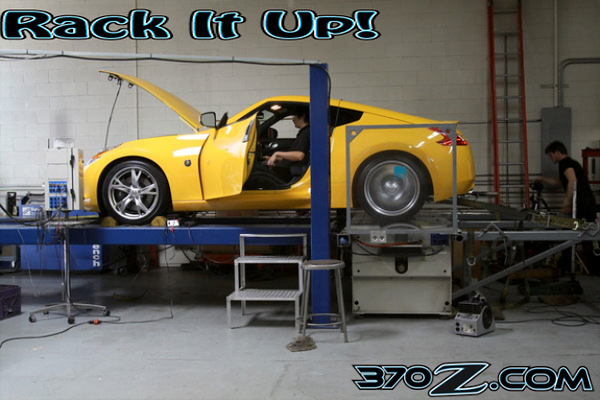 With Nissan claiming some awesome production power numbers for the 370Z, we decided to put the car through a dyno test to see if Nissan is able to back up their claims on actual production cars. Our test mules are both sport model 370Zs, bone stock from the dealer with just a few hundred break in miles. 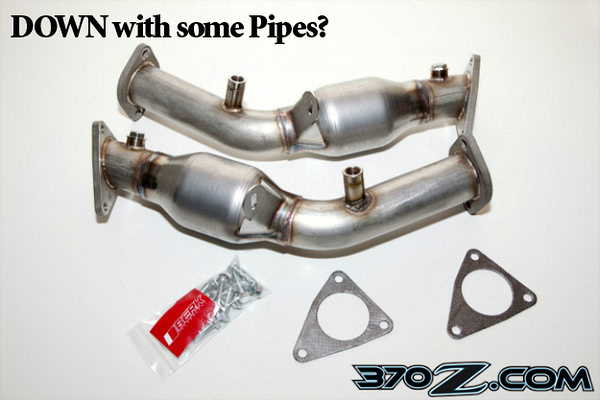 When evaluating the exhaust system on the Nissan 370Z we were amazed how restrictive it was. The tubing diameter is tiny for an engine with the output of the VHR37. To help address this issue we decided to start uncorking the exhaust system by evaluating a set of high flow Catalytic Converters and Downpipes from Berk Technology. Nismo, Nissan's factory performance arm has released a group of factory tuned performance accessories for the 370Z to the motoring public in Japan. 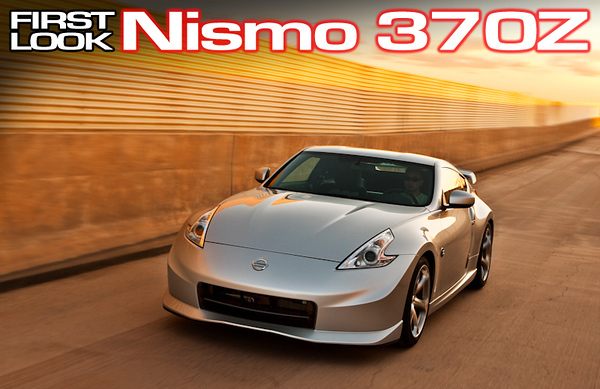 Nismo will be offering two performance packages to enhance the driving experience of the 370Z. As we stated in our engine technology section, we feel that a flash may make a huge performance difference with the Nissan370Z due to the assumed bias of the VVEL system toward FTP cycle optimization, particularly in regards to the VVEL control scheduling taking the role of engine throttle control. This means that the valve events have been compromised to fulfill compliance with parts of the FTP drive cycle instead of optimal power production and throttle response. Camber is an alignment setting on your car that denotes the angle of your wheel and tire in relation to the road surface. Camber can be zeroed out, negative, or positive. When camber is zeroed out, it means that your tire is perfectly parallel to the road surface. When camber is negative that means your wheel and tire is tilted inward at the top. The opposite is true for positive camber. 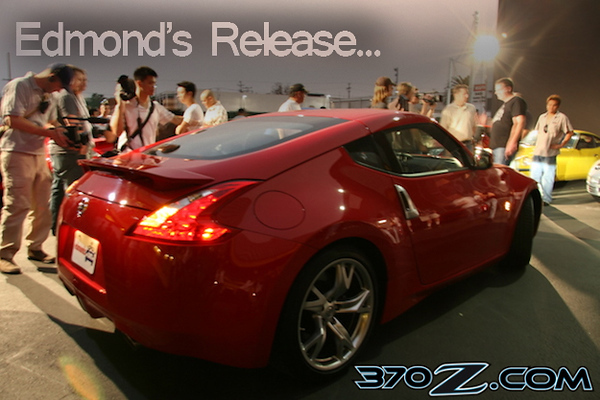 There was an air of restrained excitement last November at the first official viewing of the new Nissan 370Z hosted by Edmunds.com. Previously Nissan fans had to settle for blurry spy shots and shaky video of disguised cars being tested by Nissan on California streets and conceptual sketches shown on the internet. Now we would be able to see, touch and photograph actual undisguised production cars in the flesh.